Joseph William “Billy” Johnson, an import officer for the state metal industries of Ghana, played a foundational role in establishing the Church of Jesus Christ of Latter-day Saints in that African nation in the 1960s. Johnson was born on December 17, 1934, in Lagos, Nigeria. While Johnson’s prepared autobiography for American audiences identifies him as a devout Catholic, Ghanaian Mormonism’s local chronicler, Emmanuel Kissi, identifies Johnson as a reverend in the Church of the Lord (Aladura). Rooted in visions, prophecies, and the production of sacred scripts, Johnson’s religious background would have prepared Johnson to be receptive to the narrative histories undergirding the Church of Jesus Christ of Latter-day Saints (LDS). In early 1964, Dr. Raphael Abraham Frank Mensah, a Ghanaian schoolteacher, visited Lillian Clark, a Sufi mystic living in St. Agnes, Penhalls, United Kingdom. Clark had been meeting with LDS missionaries, Loretta Johnson and Karen Nelson, and, according to Johnson’s account, gave Mensah Mormon literature after he issued a public appeal for support in his religion-building efforts in Ghana. Upon returning to Ghana, Mensah shared with Billy Johnson his newfound interest in Mormonism and some of the literature he had received from Clark. Johnson spent the next month reading The Book of Mormon, Doctrine and Covenants, Articles of Faith, and The Testimony of the Prophet Joseph Smith. Impressed by what he read and by Mensah’s devotion to Mormonism, Johnson converted to the faith. The two began preaching “door to door” and reading from The Book of Mormon on the streets of Accra, the capital of Ghana. Johnson and Mensah, along with some of their converts, also established the Brigham Young Educational Institute. 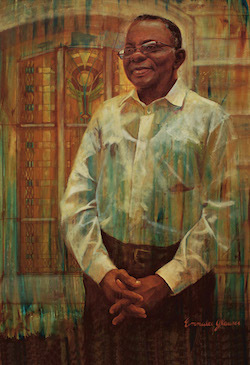 In 1969 Mensah appointed Johnson to head the Mormon congregation in Cape Coast, the second largest city in Ghana, while Mensah oversaw the congregation in Accra. Another convert, Rebecca Mould, led the congregation in Sekondi-Takoradi. For the next eight years, Mensah, Johnson, and Mould built the LDS Church in Ghana as “an offspring of the parent organization” to the Church of Jesus Christ of Latter-day Saints in the United States, with an emphasis on evangelizing and financial welfare. Eventually, Mensah became disaffected from Mormonism, leaving Johnson to work alone. Johnson’s congregation faced persecution from throughout the Cape Coast community, ranging from newspaper attacks to evictions from their rentals. Despite the persecution, Johnson, Mensah, and Mould established a functioning church bureaucracy for gathering tithes and running a mission school. After missionaries from the American LDS Church arrived in fall 1978, Johnson was formally baptized and designated branch president for the Cape Coast Branch. After the Accra Ghana stake, a network of LDS congregations roughly equivalent to a diocese, was formed in 1988, Johnson became the stake’s first patriarch. Joseph William “Billy” Johnson died in Accra, Ghana, on March 27, 2012. Joseph William “Billy” Johnson, “We Felt the Spirit of The Pioneers,” in E. Dale LeBaron, ed., All Are Alike Unto God (Salt Lake City: Bookcraft, 1990): 13-23; Emmanual Kissi, Walking in the Sand: A History of the Church of Jesus Christ of Latter-day Saints in Ghana (Provo, UT: Brigham Young University Religious Studies Center, 2004); Russell Stevenson, For the Cause of Righteousness: A Global History of Blacks and Mormonism, 1830-2013 (Salt Lake City: Greg Kofford Books, 2014); Russell Stevenson, ‘’We Have Prophetesses’: Mormonism in Ghana, 1964–1979,” Journal of Mormon History 41:3 3 (July 2015): 221-257.